Come in to the practice. Complete the forms and present them to Reception along with two forms of identification, one of which must be photographic. New patients will then undergo a new patient medical at the patient's earliest convenience. This includes a 20 minute appointment with a healthcare assistant, and then 10 minutes with a GP. 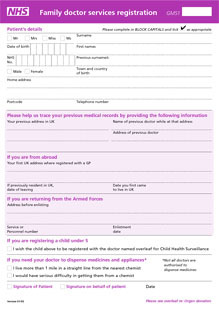 The NHS in England requires all patients registering with a GP to complete the GMS1 form. They are, of course, available to pick up from the surgery, but if you prefer you can download it from here, print it out at home, and bring the completed form with you. It requires a signature in order to be valid, so it cannot be submitted electronically. In addition, it is the practice policy that all new patients are required to produce two separate forms of identification; photographic and proof of address. Accepted items are listed below. If you are unable to provide such proof, please speak to a member of Patient Services to assist you in the registration process. If you are receiving treatment for an on-going condition, please bring all the details - including your prescription - with you. New patients registering at the surgery will only be eligible for home visits if they live within our new patient catchment. To ensure eligibility for registration, please check the catchment area map. Are you already registered in Chester? If so, where? If you are visiting from abroad you can access medical care by seeing a doctor privately for a fee. Please ask a member of the Patient Services Team for the current private consultation fees. If your country has a healthcare agreement with the UK you may not have to pay. Please visit the government website for more information. For more information, please see this leaflet. The Royal College of General Practitioners has produced a useful guide for patients about the services on offer at GP Surgeries and how to access them. You can download the guide here. © Copyright 2019 Hope Farm Medical Centre. All Rights Reserved.